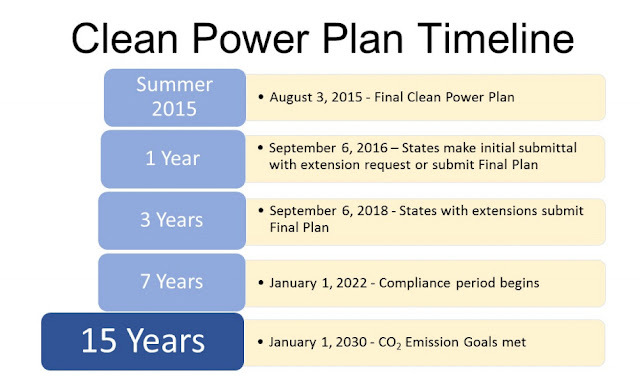 After more than 4 million public comments submitted to the EPA and hundreds of meetings with stakeholders, on August 3, 2015, President Obama and EPA announced the Clean Power Plan – a historic and important step in reducing carbon pollution from power plants that takes real action on climate change. With strong but achievable standards for power plants, and customized goals for states to cut the carbon pollution that is driving climate change, the Clean Power Plan provides national consistency, accountability and a level playing field while reflecting each state’s energy mix. It also shows the world that the United States is committed to leading global efforts to address climate change. Guidelines for the development, submittal and implementation of state plans that establish emission standards or other measures to implement the CO2 emission performance rates, which may be accomplished by meeting the state goals. BSER - Best System of Emission Reductions - To set state-specific goals, EPA analyzed the practical and affordable strategies that states and utilities are already using to lower carbon pollution from the power sector. These include improving energy efficiency, improving power plant operations, and encouraging reliance on low-carbon energy. Together, these make up the best system for reducing carbon pollution because they achieve meaningful reductions, and create jobs by driving clean energy investment and reducing energy waste to save families money. Block 1 - Improving heat rate at affected coal-fired steam EGUs. Block 2 - Substituting increased generation from lower-emitting existing natural gas combined cycle units for reduced generation from higher-emitting affected steam generating units. 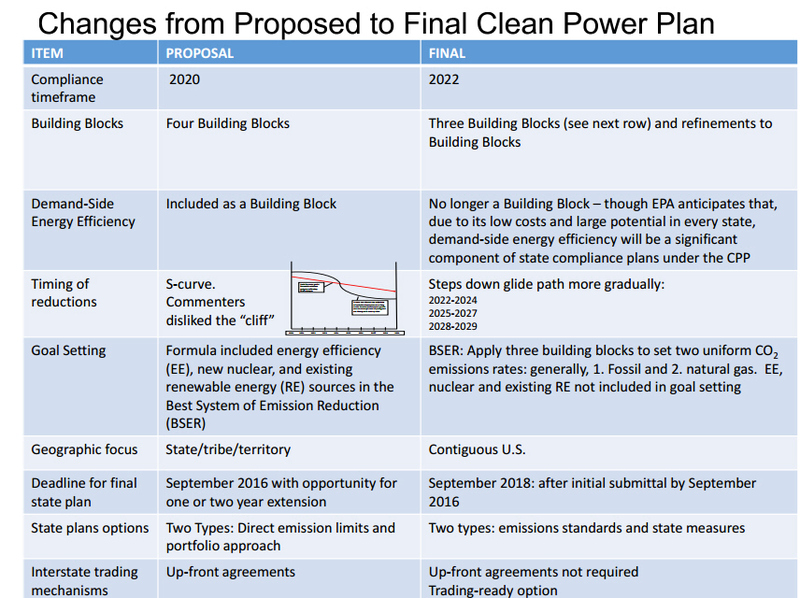 Block 3 - Substituting increased generation from new zero-emitting generating capacity for reduced generation from affected fossil fuel-fired generating units. CEIP - Clean Energy Incentive Program - An optional, “matching fund” program states may choose to use to incentivize early investments in wind or solar power, as well as demand-side energy efficiency measures that are implemented in low-income communities. Negative Externalities - Whereby the market does not internalize the full opportunity cost of production borne by society as public goods such as air quality are unpriced. If a fossil fuel-fired electricity producer pollutes the atmosphere when it generates electricity, this cost will be borne not by the polluting firm but by society as a whole, thus imposing a negative externality. The equilibrium market price of electricity may fail to incorporate the full opportunity cost to society of generating electricity. All else equal, given this externality, the composition of EGUs used to generate electricity in a free market will not be socially optimal, and the quantity of electricity generated may not be at the socially optimal level. REC - Renewable Energy Credit - geography is important. Mass-based goal with a new source complement (for states that choose to include new sources) measured in short tons of CO2Easier to administer. Don't have to worry about separate standards coal,gas, blended. The approach taken in the final rule is very different from the approach in the proposed rule. Goals give states flexibility—Each state has the flexibility to choose how to meet the goal using a combination of measures that reflect its particular circumstances and policy objectives. 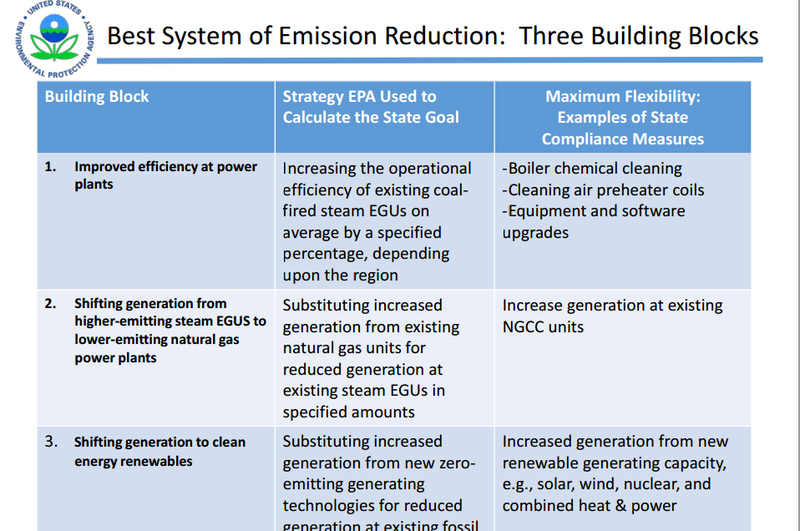 While EPA identified a mix of four “building blocks” that make up the best system of emission reductions under the Clean Air Act, a state does not have to put in place the same mix of strategies that EPA used to set the goal. States are in charge of these programs and can draw on a wide range of tools, many of which they are already using, to reduce carbon pollution from power plants and meet the goal, including renewable energy portfolios and demand-side energy efficiency measures. What programs will states pick?